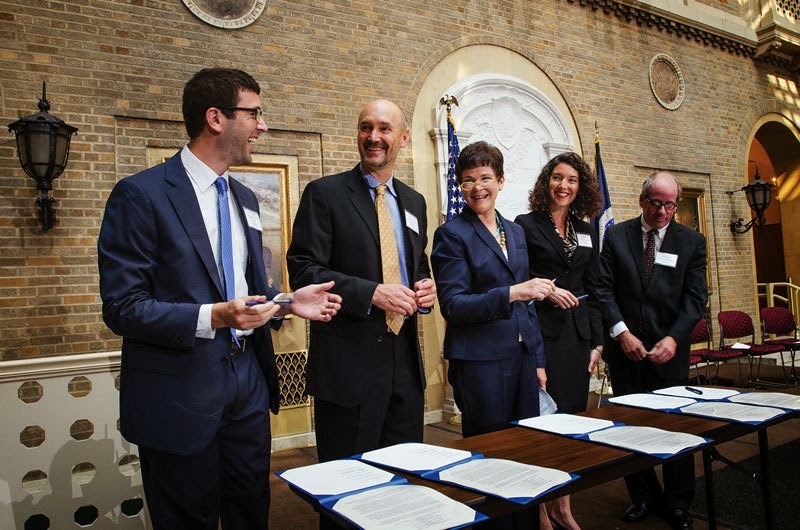 John Ackerly, president of the Alliance for Green Heat, on September 11 joined the USDA's Deputy Secretary Krysta Harden, along with leaders from, the Biomass Power Association, the Biomass Thermal Energy Council, and the Pellet Fuels Institute, in Washington for the announcement of their new partnership agreement. The alliance will jointly promote and expand the woody biomass sector, which will help to improve the safety and health of our nation's forests. "Today's announcements will help us find innovative ways to use leftover wood to create renewable energy and support good jobs in rural America," USDA Secretary Vilsack said. "Wood to Energy efforts are a part of our 'all of the above' energy strategy. Appropriately scaled wood energy facilities also support our efforts to remove hazardous fuels and reduce the risks of catastrophic wildfires." The Alliance for Green Heat is part of this partnership to work more closely with the US government to advance cleaner and more efficient wood and pellet stoves. "The USDA is uniquely positioned to help rural families better use wood and pellets to heat their homes and we look forward to working with them on that," said John Ackerly. The partnership agreement focuses on promoting wood energy nationwide as a means to address fire risk, bolster rural economic development, improve air quality and help meet the Obama Administration's renewable energy and energy efficiency goals. These organizations support the use of wood energy across the scale of users – from residential users, to commercial and institutional facilities, to industrial production of heat and/or electricity to drive businesses and feed the electrical grid. Staff from USDA and the four groups will meet regularly to develop and implement an action plan for wood energy, seeking to increase awareness of USDA program opportunities, encourage adoption of wood to energy technologies, and strengthen coordination of industry and USDA initiatives. See remarks delivered at the event by John Ackerly below. 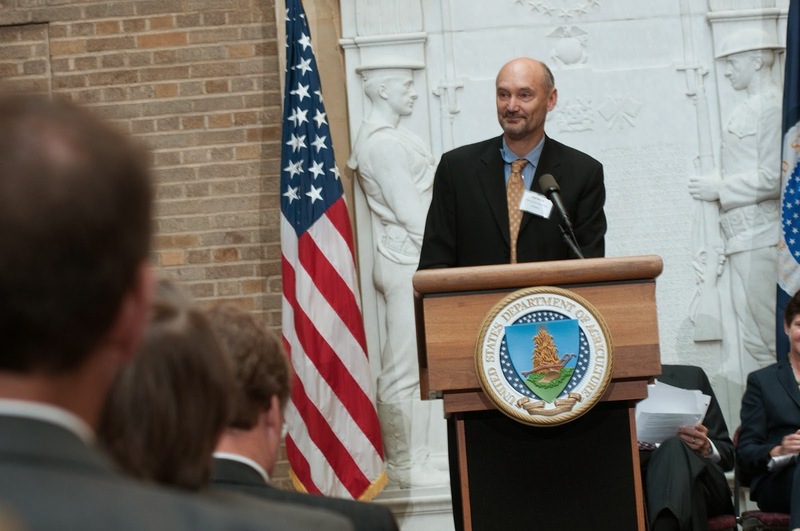 Remarks by John Ackerly at the Signing of a Memorandum of Understanding with the U.S. Department of Agriculture. I'm John Ackerly, President of the Alliance for Green Heat. We represent the interests of more than 10 million American households who heat their homes with wood and pellets. We hear about solar a lot, but families who heat with wood make three times the energy that all residential solar panels make. In fact, it's rural Americans with modern wood and pellet stoves who are leading the residential renewable energy movement and that is something we should be really proud of. With the resurgence of wood and pellet heating, it's the third most common form of heating in America after gas and electricity. But we need even cleaner and more efficient stoves on the market, and we need to help remove the older, less efficient wood stoves. The Forest Service is a partner in places like Seeley Lake, Montana, where old stoves are being replaced with modern, new ones, resulting in significant improvements in air quality. We are glad this MOU will put a spotlight on how wood and pellets can help rural families affordably heat their homes with a local, renewable fuel. On November 16th through 19th, we are holding the Wood Stove Decathlon, a competition to see what team can make the cleanest, most efficient, and most affordable wood stove, right here on the National Mall in front of this building. We are proud that USDA is a partner in this technology competition. I invite you all to come. You probably think you know what a wood stove is. Well, come check out these high-tech stoves in November: you will see computerized wood stoves, condensing wood stoves, stoves you control with your smart phone – and stoves that even charge your smart phone in a black-out. And maybe most importantly, you will see stoves that are automated with oxygen sensors, which are used in all of your cars, and are key to clean and efficient combustion in cars, boilers and many other applications. Thank you Secretary Vilsack, and also Chief Tidwell, and I look forward to seeing you on the Mall in November.